Being a believer is often inconvenient; there are rules to be followed. What’s with that? 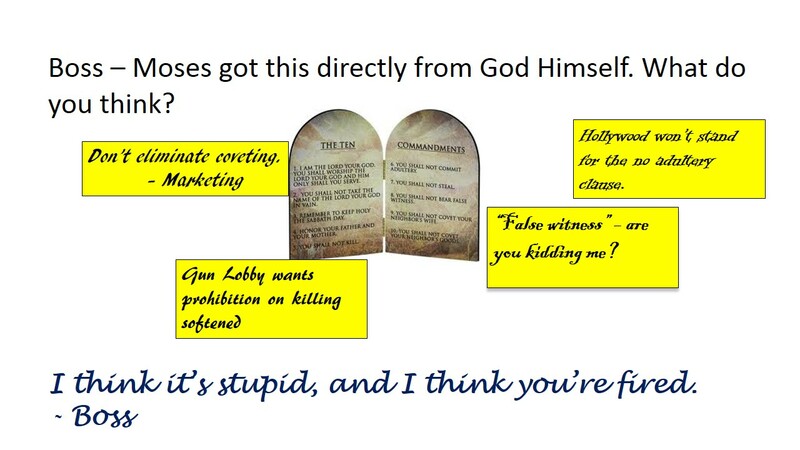 Let’s just look at the Ten Commandments. There a real drag on our lifestyles*. How might these tenets look if they were modern and politically correct?. 1. I, the Lord, am your God. Your other gods are wealth, power and celebrity. 2. You shall take the name of the Lord God in vain only as a sign of frustration or anger. 3. Remember to celebrate the Lord’s Day with golf or football, depending on the season. 4. Your father and mother should honor you. Do not let father and your mother stifle you or negatively affect your self-esteem. 5. Killing is inconvenient and messy and should be avoided, unless you’re standing your ground. 6. It’s not adultery if he or she is really hot. 7. You shall not steal, but loopholes, off-shore dummy corporations and golden parachutes don’t count. 8. You shall not bear false witness, but anything that gets you your own reality television show is okay. 10. You shall not covet your neighbor’s goods; either get bigger, faster, better for yourself or else sneak over and vandalize them. Somehow I think God’s rules make more sense. *Incidentally, the commandments appear twice in the Bible – in Exodus and later in Deuteronomy – and the two instances use words that don’t exactly match, although the ideas are the same. This has given experts all kind of ammunition to argue, modify or parse them. This entry was posted in Business, Communications, Culture, Education, Humor, Leadership, Media, People, Philosophy, Politics, Religion and tagged Bible, Book of Deuteronomy, God, Lord, Lord's Day, Ten Commandment, You shall not covet, You shall not steal. Bookmark the permalink. Good Post, Steve. I think your “pingback” responder is right about how there’s a monster in general notions of placards: They are generally wrong.